Join the Charlie Brown and his friends, Lucy, Linus, Sally, Schroeder, Snoopy, Peppermint Patty, Pig Pen, Violet and the rest of the Peanuts gang for a Holiday “Play in a Day”! This delightfully funny play shares the trials and errors of everyone as they get ready to celebrate the holidays. When Charlie Brown is sent to bring back a Christmas tree for the annual pageant, he realizes that Christmas isn’t all about glitter and tinsel. 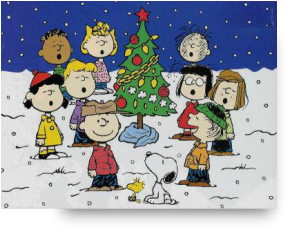 With the help of Linus, Charlie Brown and the rest of the Peanuts gang learn the true meaning of Christmas.